Once and a while we get a nice lot of books in -- all by the same author. 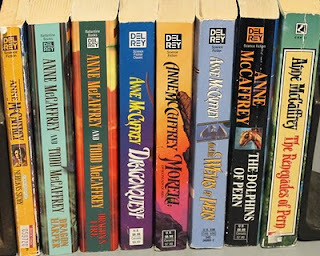 Today we received a large Anne McCaffrey selection. Some of them are on the shelves in the shop at great prices, but I've listed for auction 8 of the Pern Novels. All paperback in good reading condition. They're on eBay -- just click the link and make a bid. Nice opportunity to pick up some great reads!